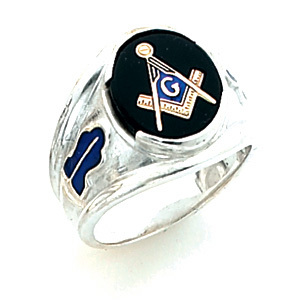 Solid back, sterling silver masonic ring has an oval stone and blue enamel side emblems. Choose red, blue or black onyx oval stone. Anti-tarnish sterlite. Blue Lodge set square and compass logo. Plumb bob and trowel enamel side emblems.